Sparta was the most formidable rival of Athens in ancient Greece. Sparta was a city-state, a race of warriors, known for their strength, courage, bravery and specifically their perseverance and endurance. The adjective “Spartan” today is used to describe the character of the Spartans and any person showing the same qualities. By the word Spartan one can relate to hardy, courageous, undaunted by pain or misfortune. Sparta was not a big city. More like a large group of straggling villages. Sparta prided itself on its courageous men, in contrast with Athens that placed great value on art and learning. Spartan government was based on the principle that the life of all individuals belonged completely to the state, from the moment of birth. New-born children were inspected by the elders of the community, and the weak and sick children were ordered to be left outside to die. By doing this Sparta made sure that only the physically fit survived. Children were raised under a rule of iron. At the age of 7, Spartan boys were removed from the control of their parents, and organized into small groups over which the strongest and bravest were made captains. Their living conditions were austere to say the least. Simple and scanty clothing, meager rations, public dormitories and hard beds were the order of the day. They were drilled daily, in gymnastics and military exercises, and were taught to endure pain and hardship without complaining. They had to obey orders without question. It would appear as though they were purposefully not given sufficient food to eat, and were encouraged to make up the rest by stealing and pilfering for themselves. Not so much to promote dishonesty, but to create an understanding of self-survival. A story often read is that of a Spartan boy who had stolen a fox, which he hid under his coat. When confronted he allowed the fox to gnaw at his flesh rather than to disclose his theft by crying out. 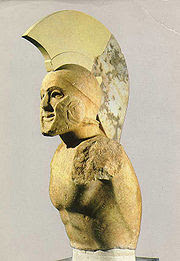 All male Spartans between 20 and 60 served in the army. They were allowed to marry but could not stay with their wives. They had to sleep and eat in public barracks. Hardships by today’s standards were many. Possession of gold and silver was forbidden, only war songs were permitted and education was minimal. Even when they spoke, few words were used. Short and to the point, which gave rise to the word “laconic” derived from Laconia, the name of the district of which Sparta was the capital.